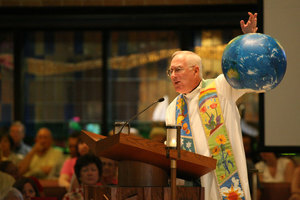 “Heaven and earth are full of your glory.” This is the psalm response for today’s Mass, and was the title given by Fr. Darrell Rupiper, OMI to his seminar/retreat programs. Fr. John Cox wrote us to say that he offered Mass this morning in loving memory of Darrell, who passed away on February 10, 2009. Earth Care – The handout Darrell often gave at the end of a session, practical things people can do. Heaven and earth are full of God’s glory. In memory of Darrell, please join us in being consciously aware of God in creation today, and doing some action that reverences the earth and promotes public awareness.